Justice Peralta sits as Judicial and Bar Council (Philippines) Chair in the Chief Justice of the Supreme Court of the Philippines Panel Interview. Diosdado M. Peralta (born March 27, 1952) is a Filipino jurist. He was appointed as 162nd Associate Justice of the Supreme Court of the Philippines by President Gloria Macapagal-Arroyo on January 13, 2009. He is the third Sandiganbayan Presiding Justice to be appointed to the High Tribunal. Chambers of Diosdado M. Peralta (new Supreme Court of the Philippines building). Justice Peralta finished his Bachelor of Science degree at the Colegio de San Juan de Letran in 1974 before pursuing law at the University of Santo Tomas Faculty of Civil Law, where he graduated in 1979. He worked in the private sector before joining government service as an assistant city prosecutor in Laoag City and Manila. On September 22, 1994, he was appointed Judge of the Regional Trial Court, Branch 95, Quezon City, which was designated as Special Criminal Court on Heinous Crimes and, later, Drugs Cases, then named to the Sandiganbayan in 2002 by President Gloria Macapagal-Arroyo. 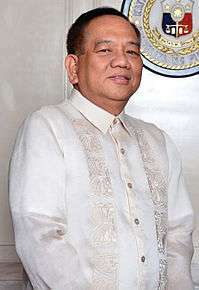 He was designated Presiding Justice of the Sandiganbayan in March 2008, and served in that capacity until his appointment to the Supreme Court. In recognition of his vast contribution in the field of law, he was the recipient of the Outstanding Thomasian Alumni Awards for Law (TOTAL Awardee in Law/Justice) on August 2, 2008, which was the highest award bestowed by the University of Santo Tomas to an alumnus. 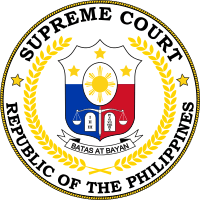 Justice Peralta is the Chairperson of the High Court's Committee on the Revision of the Benchbook on the Application, Computation, and Graduation of Penalties. He presently sits as a Member of the House of Representative Electoral Tribunal (HET). Justice Peralta was the Chairman of the 2014 Philippine Bar Examination committee. He is married to Fernanda Lampas-Peralta, an Associate Justice of the Philippine Court of Appeals. 1 2 3 4 "Sandiganbayan justice is new SC magistrate". GMANews.TV. 2009-01-14. Retrieved 2009-01-14. ↑ "Peralta new Sandiganbayan presiding justice". GMANews.TV. 2008-03-29. Retrieved 2009-03-29. ↑ "Sandigan Justice leads TOTAL". The Varsitarian. 2008-09-07. Retrieved 2008-09-07. ↑ "Bar exams set on October". Manila Bulletin Online. 2014-04-29. Retrieved 2009-01-14. Wikimedia Commons has media related to Diosdado Peralta.